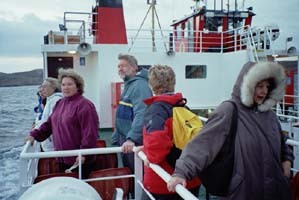 On the ferry ride from Oban to Mull, there was a loud, yet cheerful Texan sounding person in a group. "This must be the American boat," I tried starting a conversation that rolled on for a while until it whittled down. "Have you ever been to Iona before?" he replied. Off the boat and on the Isle of Mull, I walked away from the bus in the drizzle. "I'm sorry, but this bus is a private charter. The public bus will come in two hours," the driver said. I guess I'll take a walk around the dock. It was the friendly Texan-sounding guy from the boat, Bob, and his group was the private charter. They welcomed me aboard as a mascot across Mull to the next ferry bound to Iona. Upon climbing aboard, gospel music blasted. This would be an appropriate American style transition to this Celtic isle, then Bob delivered a top-notch historical introduction to Iona. The place has more religious tourists/pilgrims than the Vatican, at least percentage wise. I had arrived to find my mother waiting in the hotel's North lounge, knitting by the fire - a warm welcome in everyway. It was great to also find yet another reader of Sauntering, Marilyn, on the island, whose replies and comments I've always enjoyed. The island itself is howled by wild winds and sometimes pelting rain between the sunshine interludes. Surprisingly, during all this, we always felt warm. Fierce yet mystically comforting, my one mile pitch dark walk back to the hostel each night was never accompanied by an over active imagination of the haunts from ages ago. During the daylight, behind a dune hill provides momentary wind relief. The North beach is strewn about with rock formations of another world and seaweed: carcass of alien life. On the West side of the island, two seals watch the people set off on hikes through the Easter egg rock strewn grass where the shift between beach, grass and stream are distinct with not an inch of sandy soil or muddy water between the boundaries of these landscape features. 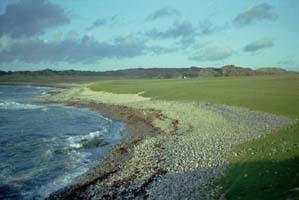 The destination is typically Columbia Bay, where the Celts landed bringing its flair to Scotland and the rest of Europe. 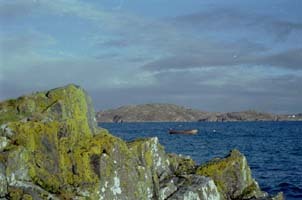 It is on this bay where the unique Iona marble is found, white with veins of green. Above the hills above the bay are the most staggering winds. Pour some liquid and you'll be amazed at how it scatters and flows UP into the air in all directions! You might want to avoid my surprise and not take a leak until in a valley. I left Iona with my mothers groups where we were scooped up by my two cousins, Gordon and Steve to be whisked away for a whirlwind tour of the area, peeking at Stalker Castle, Glencoe and the most scenic castle ruins I’ve been to yet (though the name escapes me at the moment). The survival of the underdog, walking freely amidst the heathers, feeling warm in the wild weather… there’s something about remote places in Scotland, albeit Iona is what I would call a very “accessible remote place.” Of course for me, it was special to be united with "me mum" and meeting some of her friends - it is clear that she lovers her homeland too. But there’s something else. It feels that the mountains and ruins may be haunted, but with friendly spirits, perhaps glad we’ve stopped by to hear their stories. It was Kilchurn (kill-kurn) Castle on Loch Awe we visited. The five story tower above the basement and prison was built in 1475 by Colin Campbell, Lord of Glenorchy. The three round towers, hall, courtyard and barrack block were added later. The Campbells of Glenorchy became known as Earls of Breadalbane in the late 1600s ... when the barrack block housed 200 soldiers. The castle was abandoned in the 1760s. There are five castles in the Argyl area, Castle Sween built in the 1100s being the oldest standing castle in Scotland. You'll just have to go back! There's so much more I would have liked to do in Scotland, and I'll be back for sure. I do feel at home there ... more later when I get my notes together. Centuries before the arrival of St Columba from Ireland in 563 Iona had been a center of religion for the Celts and Druids. Like Columba, these priests and early mystics sensed something unique in the atmosphere of Iona, a quality that still sets it apart as a spiritual oasis. Monks began inscribing the Book of Kells on Iona, which was sent to Ireland in the 700s for safe keeping during the Viking raids. 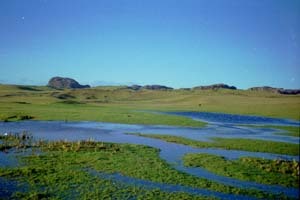 Iona is said to be the burial place of sixty kings: forty eight Scottish include the famous Duncan and Macbeth, four Irish, and eight from Norway. High crosses from the eighth century and traces of buildings predating the 1203 Benedictine Abbey remain. The Iona Community, founded in 1938 with members all over the world, is dedicated to peace and justice issues. From the famous white sands of the north beaches to the crashing waves and rugged southern coast near St Columba Bay, Iona offers a rare beauty in the diverse terrain, spectacular views, and a sacred connection with nature. 37 AD St Joseph of Arimathea to Marseilles, Rhone to Images, Provence, Aquitaine, Brittany, Cornwall, Glastonbury, Isle of Avalon (Glastonbury legend). 40-50 St Paul converts the Celts of Galatia. Conversion continues to 500. 43 Romans occupy south Britain/England. 80 Romans invade Scotland but do not occupy. 100 Celts wiped out in Europe by the Roman Empire. Survived in Wales, Ireland, Scotland. 120 Hadrian's wall built by Romans on the English/Scottish boarders to keep out the "barbarians" unintentionally gave the highland Celts peace. 313 Emperor Constantine makes Christianity official bringing immorality and decline in the church - counter movement of Christians to desserts of Europe to maintain ascetic and devoted lives. 390 St Ninian, Scotland - community Candida Casa, founded first Scottish Christian church in Whithorn, then Perth - died 432. 410 Roman troops leave Britain. Anglo Saxon invaders destroy churches, except in the west. 450 St Germanus, Illtyd (425-505 founder of Welsh Church/community Llanilltud Fawr in Glamorgan), Sts Samson, Petroc - Wales and Cornwall. 455 St Brigid, Abbess of Kildare, Ireland. Died 532. 500 St David, Llanbelig in Snowdownia, Wales -589. St David's cathedral, Black Mountains. 500-1800 Gaelic was the national language. In 1300 two gaelic languages established (Irish and Scottish). 520 St Finnian's monestary, Meith, Ireland. 521	 St Columba of Donegal, Ireland (died 597). Made deacon 540, monastic settlement in Derry, Ulster 546, Iona, Scotland, 561, with twelve companions following the Cul Dreimne battle. 540 St Columbanus, ordained 572, to Gaul (France) 591, community in Bobbio, Italy 610 where St Francis visited. Died 615. 597	 St Augustine sent by Bishop of Rome to England - oppressive to the Celtic churches. 627 St Hilda (614-680), baptized. Became Abbess of Whitby, where Caedmon wrote poems and songs. Partner community to Aidan and Lindisfarne. 635 Aidan sent from Iona to Lindisfarne, England. Died 651 Evangelist brothers Cedd, Chad - community at Lichfield. 651 St Cuthbert (634-687), shepherd, saw Aidan's soul taken to heaven, went to Melrose-trained by Boisil the Prior, became prior, then Bishop at Lindisfarne. Farne Island hermitage. 664 Synod of Whitby re differences between Roman (Peter/institutional) and Celtic(John/relational) ways. Enforced Roman doctrines and rituals. Accepted in northern Ireland, Scotland and Wales. 690 Lindisfarne Gospels inscribed, then the Book of Kells; stone crosses built. 793 Viking invasions destroy monastic communities. 826 Church of Scotland headquarters moved from Iona to Dunkeld because of Viking raids. 990 Thistle adopted as national emblem (warned Scots of approaching attack form Vikings near Perth) 1034	King Malcolm II slain by grandson Duncan, who was slain by his successor MacBeth 1040, who was slain by Malcolm III aided by English King Edward. 1138 Abbeys founded at Holyrood, Melrose, Dryburgh, Kelso, Jedburgh, Newbattle, Kinloss. King David I led army into England. 1171 Synod of Cashel-Irish monastic episcopate abolished and continental-style episcopacy imposed. 1263 Viking Haco, King of Norway, ruled western isles of Scotland since 700s, defeated at Largs. 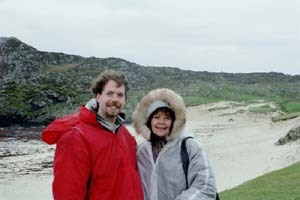 Died at sea near Orkney while returning home. 1289 Margaret of Norway, ruler of Scotland, married King Edward of England by arrangement. Scotland remained a separate realm. She died in Orkney 1291. Thirteen claimed the Scottish throne. Although unaccepted by the Scots, Edward held claim, broke the Great Seal of Scotland, and forced allegiance from the people through military forces. The English defeated the Scots at Dunbar and Edinburgh in 1296 - took the coronation stone from Scone and sent it to Westminster. In 1297 William Wallace of Dundee who united the clans against the English, defeated the English at Stirling and was knighted "Defender of Scotland" by the Scottish Lords. He was defeated at Falkirk in 1298 and executed in England in 1305. The 1996 film "Braveheart" depicts the story of William Wallace. 1300 Scots clergy pleaded case against England in Rome. Pope Boniface VIII sided with Scotland. 1306 Robert the Bruce, crowned at Scone. A year later the Earl of Pembroke was sent by English King Edward with forces into Scotland - defeated by Bruce after killing his relatives and imprisoning his wife and daughter in England. Bruce was declared a fugitive king, excommunicated by the Pope for killing someone in a church. 1308 he defeated the English at Inverurie. 1314 English held only Stirling after Bruce defeated them at Bannockburn using horses and spears, and in Berwick and Yorkshire. There was a truce for two years when 60 villages were exempt from English tax. 1320 Declaration of Independence written at Arbroath Abbey, signed by 38 Scottish lords, delivered to Pope in Rome. Bruce died of leprosy in 1329 - body buried in Dunfermlin Abbey, his heart at Melrose. His son, five year old David, was crowned at Scone, and sent to France for protection. 1333 the English invaded Berwick. The French allied with the Scots, but were defeated by English and captured David, who was then released in 1357 for ransom of 100,000 marks and 20 nobles. David died in 1371 and was succeeded by Robert the Bruce's grandson, Robert II, a Stewart. 1383 A truce was signed between England, France and Scotland. 1390 John Robert Stewart succeeded Robert II. 1460 Scots invaded England recovering Roxburgh and Berwick. 1469 James III of Scotland married Norway princes. Nobles hung his favorite friends in 1482, charging them as evil advisors. In 1488, after fleeing battle and falling from his horse, James was stabbed in bed. 1513 James IV went into England as requested by the French Queen. Defeated at Flodden. 16 month old James V now King. 1517	 Reformation began with Martin Luther, German, protesting practices of Roman Catholic Church. John Calvin, Switzerland, France, W. Europe; John Knox, Scotland. Protestent split - Zwingli, Switzerland, Annabaptists. 1522	 John Knox, Glasgow University - then to Europe, friend of Calvin - returned to Scotland 1559. 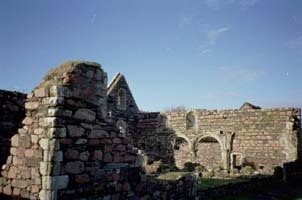 1546 George Wishart burned at stake in St. Andrews. Cardinal Beaton murdered for approving. 1547 Henry VIII invaded Scotland. Mary Queen of Scots, age 6, sent to France for safety. At age 12 she married the French Dauphin and signed Scottish rights over to him. He also became King of France. A year later he died and Mary returned to Scotland and married Henry Stewart, Lord Darnley (her cousin from England). She proclaimed him King of Scotland. Her lover, David Rizzio a musician, was stabbed by Darnley. James VI born. Next lover, James Hepburn, Earl of Bothwell, murdered Darnley and married Mary and renownced the crown. Her son James VI was crowned King of Scotland in Stirling. She was imprisoned in Lochleven Castle for Darnley's murder but escaped. Her 6,000 troups were defeated. She fled to her cousin Elizabeth in England, who imprisoned her. She conspired with Anthony Babington to murder Elizabeth and be set free. The conspiracy was discovered and Mary was beheaded in 1587. James VI, King of Scotland, son of Mary, married Anne, daughter of the King of Denmark, and was named King of England on Elizabeth's death in 1603. 1605 Guy Fawkes plotted to blow up the Houses of Parliament in London. 1617 King James VI decides ministers would receive stipends. 1625 James died and son Charles succeeded him as King. 1637 King Charles I imposed Roman prayer/service books - caused hostility and petitions, group formed called the Covenanters. Charles beheaded 1649 for high treason. 1688 Persecution of Presbyterians subsided. 1792 Highland clearances: crofters expelled; clans abolished; gaelic, kilts and bagpipes banned English made the official language. 1848 First College for women founded by Alexander Scott. 1855 Alexander Carmichael, Island of Lismore, Argyll, put together Carmina	Gadelica (Gaelic songs and prayers) from western isles. 1938 Iona Community founded by George McLeod. 1200 Abbey restored. 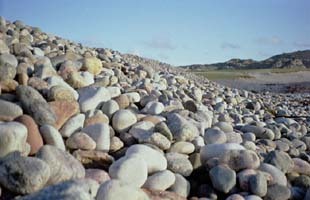 1994 Community of Aidan and Hilda founded on Lindisfarne, England (see 635) by Ray Simpson.